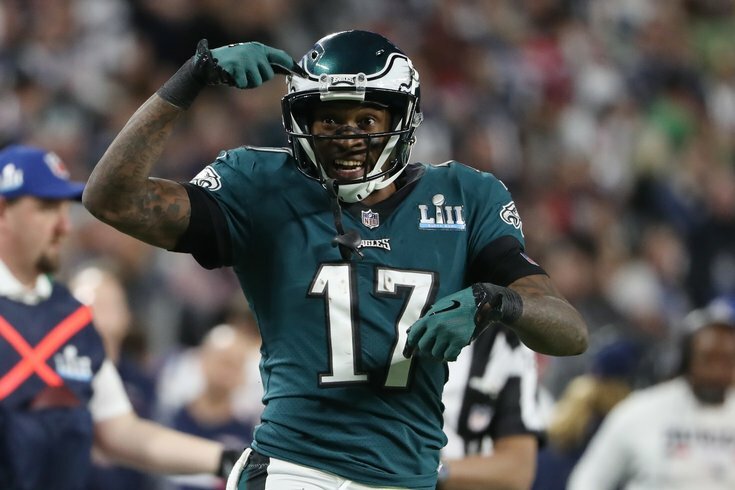 Philadelphia Eagles wide receiver Alshon Jeffery reacts after a catch against the New England Patriots in Super Bowl LII. For more than a year, Alshon Jeffery has known that he'd be hoisting the Lombardi Trophy on Sunday night. Before he signed with the Eagles, before he'd ever caught a pass from Carson Wentz – or, for that matter, backup-turned-Super-Bowl-MVP Nick Foles, who was still with the Chiefs at the time – and long before anyone knew just how good this team could be, the 27-year-old made a guarantee that many laughed off at the time. “I guarantee you we’ll win the Super Bowl next year,” a confident Jeffery said back in January 2017, according to The Chicago Tribune. The only problem? His team, the Chicago Bears, sucked. The Bears (3-13) had just finished with their worst record since the NFL moved to a 16-game season in 1978, and here was their free-agent-to-be wideout guaranteeing a Super Bowl title. Well, that's not exactly what happened. Jeffery went on to sign a one-year deal with the Eagles in the offseason (and later a multi-year extension to remain in Philly) while the Bears, well, they went on to finish 5-11, good for last place in the NFC North. That, however, doesn't mean Jeffery was wrong. After all, he did win the Super Bowl, just like he promised ... and he never actually said it would be with the Bears. At the end of last season when he was still with the Bears, Alshon Jeffery said, “I guarantee we win the Super Bowl next year.” Asked about it, Jeffery said he never specified the team in his quote. That wasn't the only time Jeffery guaranteed an Eagles' Super Bowl victory. Just days before the game, knowing that he would be going up against the reigning champion New England Patriots, the Eagles wideout doubled (tripled?) down on his previous prediction. In fact, Jeffery practically guaranteed an Eagles victory after he was asked if the Eagles are going to win, what has to happen? Jeffery cut the question off, and said: "Ain’t no ‘if,’ man. When we win on Sunday, ain’t no telling what we’re going to do. But we’re probably going to celebrate, have some fun." The reporter followed up by asking if Jeffery is convinced that the Eagles are winning. On Monday, the Birds returned home, Lombardi Trophy in hand. And Jeffery played a big part in delivering Philly its first Super Bowl title. He finished with three catches for 73 yards, including this ridiculous grab on a 34-yard TD pass from MVP Nick Foles.